In thanksgiving for the victory of Lepanto, an ancient stronghold of Greece and a modern port of that nation, Saint Pius V in 1571 instituted an annual feast in honor of Our Lady of Victory. Two years later, Gregory XIII changed this title to Our Lady of the Rosary; in 1740, Clement XII extended the feast to the universal Church. We have related in the life of Saint Pius V the victory of Lepanto; here we will speak of the Rosary itself, granted to Saint Dominic by Our Lady Herself in the thirteenth century, with promises of the greatest blessings for those who recite it well. The Rosary of fifteen decades affords a simple means of meditation on the principal mysteries of our holy Religion, and a means of drawing closer to the Saviour through the intercession of the One to whom He never refuses anything. One can also say the chaplet of five decades, since the fifteen are divided into three groups of five: The Joyful, the Sorrowful, and the Glorious Mysteries of the life of Christ. On the crucifix, one recites the Credo or Apostles' Creed, which the Apostles themselves composed at the first Council of Jerusalem, before their definitive separation, thereby resolving the question of what exactly should be taught to the neophytes. By it we honor the Three Persons of the Holy Trinity and express our faith in the Church established by God; in the Communion of the faithful, whether living or deceased; in the pardon of sins, the general resurrection at the end of the world, and eternal life. Before each decade, the Pater or Our Father, taught by our Saviour Himself when His Apostles asked how they should pray, includes three petitions for the glory of God in heaven: May His Name be sanctified, rendered holy in the sight of all nations; may His Kingdom come  the interior reign of God which renders Him the Sovereign governing every heart and mind by His love  this, while we await Christ's own final return as visible King of His Church and all creation; thirdly, may His Will be accomplished on earth, to perfection, as it is in heaven. There follow four petitions for ourselves and our salvation. We ask, under the general term of our daily bread, that God provide for all our needs, both spiritual and material; we beg His forgiveness for our sins, in the same measure we have forgiven our neighbor's offenses, real or imaginary. And we implore to be spared temptation or to be delivered from succumbing to it and all other evils that would separate us from God. In the Ave Maria or Hail Mary, we repeat the words of the Angel Gabriel to Mary (Luke 1:18), repeated and augmented by Saint Elizabeth at the Visitation (Luke 1:42), adding the invocation of the Church for Her aid at the present moment and at the formidable hour of our death. After each decade, we add the Gloria Patri or Doxology, to honor the Three Persons of the Holy Trinity. The Joyful Mysteries: The Annunciation, the Visitation, the Nativity of Jesus, the Presentation of Jesus in the Temple, the Finding of Jesus in the Temple. The Sorrowful Mysteries: The Agony in the Garden of Gethsemane, the Scourging at the Pillar, the Crowning with Thorns, the Carrying of the Cross, the Crucifixion and Death of Jesus. The Glorious Mysteries: The Resurrection, the Ascension, the Descent of the Holy Ghost upon the Apostles, the Assumption of Mary, the Crowning of the Blessed Virgin in Heaven. 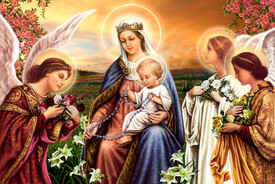 Can one imagine a more perfect prayer than the Holy Rosary of the Queen of Heaven, the Blessed Virgin and Mother Mary? It would require large volumes or even an entire library to narrate the graces and miracles that have been obtained by its humble recitation. By the grace of God I am what I am, and His grace in me has not been fruitless.